Smart wheels, vehicle wheels that use artificial intelligence to deal with road conditions, are under development by scientists at the University of Portsmouth in the UK. All four of the wheels on the car are "smart." They use microprocessors to perform 4,000 calculations per second and communicate with each other. As the car is driven, each wheel adjusts according to traveling speed and road conditions. Artificial Intelligence controls the suspension, steering and breaking systems, teaching it to adapt to bends in the road, potholes and other potential hazards, and compensating by adjusting the car's reactions. The information is retained in the computer's memory and used the next time the car encounters similar road conditions. The car is learning as it drives and adapting its performance accordingly. "Traditional suspension means the vehicle dips when the wheels detect poor road surfaces and you get a bumpy ride, while a tight corner means the drag will slow the vehicle down. Electronic traction control and suspension will counterbalance this kind of drop and drag effect but the driver won’t even know it’s there. It means a faster car but a safer one." The first car with thinking, smart wheels? A Mini was converted into an all-electric vehicle (EV) with four direct-drive wheels. Each wheel has an electronic hub motor with 160 break-horse-power. A tiny muscle car, the Mini can accelerate from 0 to 60 mph in 4.5 seconds. 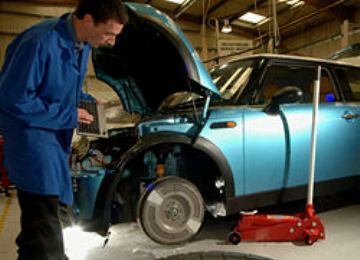 Not quite the same picture, but the UK smart wheels also plant themselves precisely according to road conditions. You might also remember the Michelin Tweel, which used a unique bendable spoke system to achieve ride cushioning. Another interesting take on the idea of a "compliant" wheel system is the totally unique Soft Robot Powered By Shape Memory Alloy Spokes. Via University of Portsmouth and Roland Piquepaille.